ST. CLOUD, Minn. – The Gustavus women’s hockey team earned its sixth consecutive win Friday night at Saint Benedict in a 3-1 decision. The victory gives the Gusties two more points in the MIAC standings as they still have a shot at the conference championship and No. 1 seed in the league playoffs. Hamline and St. Thomas tied tonight, meaning the Gusties and Tommies are tied at 27 points, while the Pipers are at 28 points. A Gustie win tomorrow coupled with a Tommie/Piper tie would result in a shared MIAC title for Gustavus and Hamline. A Gustie win coupled with a Tommie win would result in a No. 1 playoff seed for Gustavus since St. Thomas is ineligible for postseason play. After a scoreless first period Friday at Dave Torrey Arena, Saint Ben’s took advantage of a power play with a goal early in the second, but that would be its only lead and score of the game. 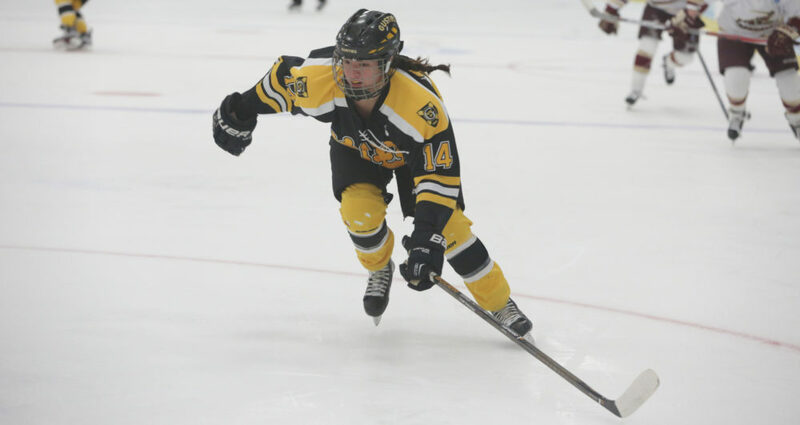 Nearly four minutes later, the Gusties countered with a power play goal of their own off the stick of Kaitlyn Klein (Sr., Plymouth, Minn.), her team-leading 22nd of the season, assisted by Katy Fuller (Sr., Minneapolis, Minn.) and Sydney Henrichs (Fy., Eden Prairie, Minn.). The score remained tied 1-1 after two periods before Fuller scored her second goal of the season, which proved to be the game-winner 9:19 into the third frame. And with the Blazer goalie pulled late in the game, Amelia Vosen (So., Anoka, Minn.) scored an empty-netter to secure the victory. The Gusties won the shot count 47-14 as Amanda DiNella (Jr., Oakbrook Terrace, Ill.) made 13 saves in goal. The Gusties went 1-for-3 on the skater advantage and killed off 3-of-4 Blazer power plays. The Black & Gold almost doubled up on the dots, winning the faceoff battle 39-20. Gustavus and Saint Ben’s wrap up the series 2 p.m. tomorrow at Don Roberts Ice Rink on Senior Day.